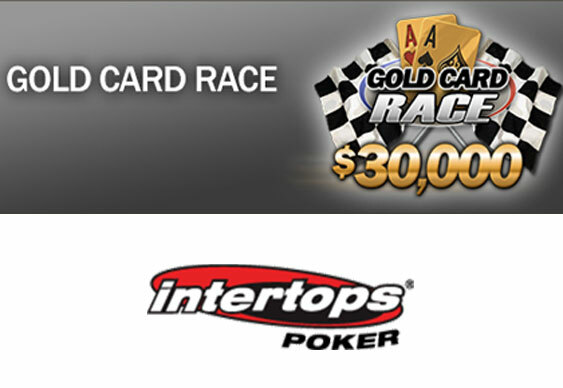 Intertops Poker likes to sweeten things for its players by offering special bonuses courtesy of its random Gold Cards. Those Gold Cards could prove to be even more valuable with additional weekly prizes of up to $500 in a special Gold Card Race contest. Every Wednesday until 7 May the top 200 players for that week will receive cash bonuses totaling a cool $30,000. The next weekly race gets under way tomorrow, 24 April and continues until April 30 with the fourth and final race following from 1-7 May. Gold Cards are awarded every time a table reaches a pre-determined rake amount so while more will be seen at the higher stakes tables they can certainly be awarded at all levels and stakes. The value of each Gold Card is dependent on how it’s used with cash and tournament buy-ins proving popular with players. In this latest contest, each Gold Card earned is worth 'miles' on the leader board. The higher the value of the Gold Card, the more miles that are earned and Intertops Poker multiplies it based on table-stakes. Players at Intertops also have the chance to earn a big score for pennies courtesy of its 'Series 2013'. Daily satellites for the $5k final start at just $0.50. From 1 May, $5,000 combined value of Gold Chip and Gold Card satellites will be added.